In 1943, Warner Brothers set out to film an account of the Brontë siblings, focusing mainly on the lives of authors Charlotte (Jane Eyre) and Emily (Wuthering Heights). In the 1930s and 1940s, the studio produced many successful historical biographies. 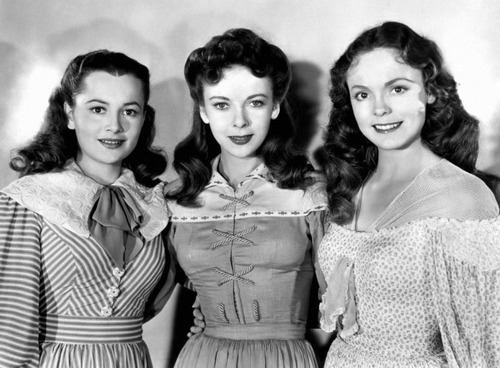 Film versions of both Wuthering Heights (1939) and Jane Erye (1943), produced by rival studios, hit box office gold, so wouldn’t a movie on the lives of the authors and real-life sisters be a hit too? That was part of the thinking behind Devotion, a production that seemed to be doomed from the beginning, but succeeds in spite of itself. Before production started, Warner Brothers had hoped that movie star sisters Joan Fontaine and Olivia DeHavilland would play Emily and Charlotte respectively. Fontaine wasn’t available, so Warner Brothers replaced her with Ida Lupino, who was already under contract to the studio, as was DeHavilland. Nancy Coleman played youngest sister Anne, and Arthur Kennedy played Branwell, the only boy in the Brontë brood. The cast was rounded out with Paul Henried as the Reverend Arthur Nicholls, Sydney Greenstreet as William Makepeace Thackery, and Montagu Love, in his last film role, as Rev. Brontë, patriarch and widowed father of four gifted and complex children. The studio employed some of its top talent for the film’s production. Curtis Bernhardt (Possessed, 1947) was tapped as the director. Oscar-winner, Ernest “Ernie” Haller (Gone With The Wind, 1939) was assigned the cinematography duties, and Perc Westmore was on hand for makeup. The lush score was composed by Erich Wolfgand Korngold who won an Academy Award for scoring The Adventures of Robin Hood (1938). One of the major criticisms of the film is that it plays fast and loose with the facts, although Hollywood biographies of the period were hardly known for their absolute accuracy. As is often noted, the Brontë sisters were not famous for their attractiveness, but Lupino, DeHavilland, and Coleman are all quite beautiful in the movie. But come on, it’s Hollywood where there are no plain Janes. For “poor” girls, they sure have some great clothes! The Brontë’s weren’t wealthy by any stretch; in fact, they were quite poor. Jane Erye’s Lowood school was partly based on the four older sisters’ experiences at the Clergy Daughter’s School at Cowan Bridge, where the eldest Brontë daughters, Maria and Elizabeth became ill and died. Charlotte and Emily returned to Howarth, England, and were homeschooled by their father. The movie version hints at their lower economic circumstances, but the sisters Brontë are always beautifully, if simply, dressed and coiffed. In the film, older sister Charlotte, as portrayed by DeHavilland, is somewhat self-centered and a bit snobby compared with Lupino’s more cerebral and serious portrayal of Emily. As the youngest sister Anne, Coleman doesn’t have much to go on. Her character has minimal screen time and no real story line to follow. Kennedy’s Branwell is a tortured self-destructive soul. The real Branwell struggled with drugs and alcohol, so Kennedy’s portrayal does seem close to the truth. As melodrama, Devotion is quite satisfying. Lupino and DeHavilland obviously took their roles seriously and give excellent performances, as does Kennedy. Henried is fine as Nichols, although some critics at the time didn’t find him at his best. 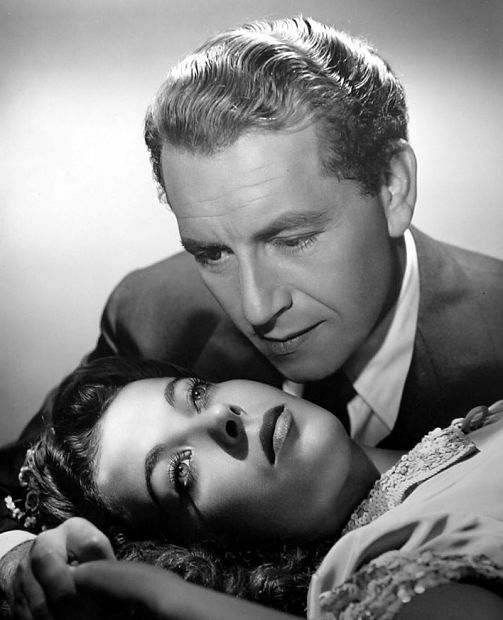 Bosley Crowther in his New York Times review said, “Paul Henreid plays Arthur Nicholls with the air of a faithful setter dog.” In the broader context of his review, that was actually a compliment, since Crowther didn’t like the film overall. But Crowther and many other critics couldn’t get past the liberties the screenwriters took with the facts. In the film, Emily and Charlotte are both in love with Nicholls; however, there is no evidence that Emily was involved with her father’s curate or even had any feelings for him. Charlotte eventually married Nicholls, but she refused his first proposal and some Brontë historians believe Charlotte, although fond of Nichols, was never really in love with him. In the film Charlotte is infatuated with Professor Heger while studying in Brussels. Again there is no evidence that any romance took place. Events are out of order, which bothered purists like Crowther, but for lovers of classic film, Devotion is fun to watch. at Paramount after she successfully sued Warner Brothers. I love Lupino’s brooding, wistful Emily. When she shows Nicholls the moors and the house in the distance that she calls Wuthering Heights, with Korngold’s score at full tilt, it’s wonderful. Emily’s dream sequences are artfully done, too. The dark mysterious man on horseback haunting Emily looks quite spectacular on the screen. DeHavilland’s snobby and bossy Charlotte can be obnoxious, but she’s far from unlikable. When she professes her love for Profesor Heger, she’s convincing and sincere. Who cares if it didn’t really happen? It’s effective filmmaking. When the film wrapped, Warner Brothers held back its release. There are a few stories explaining their decision. Some say the studio delayed the release because they felt a costume drama wouldn’t play well during the height of World War II. 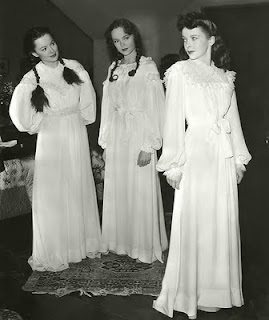 The studios were sensitive about showing too much opulence on the screen during the war years, but rival Twentieth Century Fox released Jane Eyre in 1943 to great reviews and good business. The other, and more intriguing explanation, involves DeHavilland and her lawsuit against the studio. During the studio era, stars signed long-term contracts, typically for a period of seven years. Under that system, actors were paid a weekly salary and expected to perform in movies assigned them. If a star refused a role, they were put on suspension without pay until production of the film they refused to star in was completed. In addition to not paying the star’s salary, studios added time spent on suspension to their contracts, potentially extending them almost indefinitely. DeHavilland was fighting this practice in court. The story goes that so angry was the studio with DeHavilland that they refused to promote her career during the litigation. Whether or not their anger would go so far as to shelve a big-budget movie like Devotion to make a point, seems over the top. However, movie moguls from the period could be vindictive and spiteful. 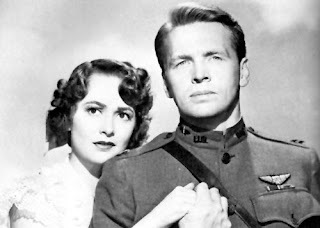 When the film was finally released, DeHavilland was under contract to Paramount. Warner Brothers wouldn’t let her attend the premier. Even worse, they gave her third billing behind Henried, which would never have happened had she been in the good graces of the brothers Warner. Considering how hot DeHavilland’s career was after she left Warner Brothers, it would have made sense, from a business perspective, to have let her participate in the film’s publicity. Hard to tell if we’ll ever really know the story behind Devotion’s delayed release, but it’s fun speculating. Devotion may not be an accurate portrayal of the lives of the most famous of the Brontë sisters, but as film entertainment, it’s a lot of fun. Lupino, DeHavilland, Henried, and the rest of the cast are such pros, they make you care about their characters. Would it have been a better film if they spent more time on historical accuracy? Perhaps, but did audiences complain that both the 1939 version of Wuthering Heights and the 1943 version of Jane Eyre left out major plot points and characters? Hardly. That’s one of the reasons Devotion remains one of my favorite guilty movie pleasures. What do you think? Is there a classic movie that you love, but the critics hate? Please feel free to share your favorite guilty movie pleasures here.